The Kensington ClickSafe™ lock is designed to be the strongest and easiest-to-use lock available without compromising security. Designed to fit busy daily routines, ClickSafe’s™ superior strength and ease of use makes your first line of defence even stronger. ClickSafe™ locks have been designed to protect your business, they’ve been designed to be used. ClickSafe™ A simpler, safer and smarter investment. The ClickSafe™ lock has been engineered to deliver strength and ease of use. A keyless locking motion makes the employees’ role in protecting your business easy. All they have to do is ‘click’ it on and your business is safe. 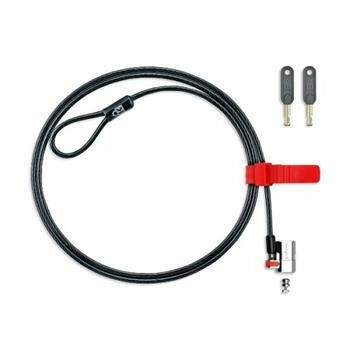 Kensington ClickSafe™ locks are constructed from the strongest materials to deliver the best security available from a cable laptop lock. A high carbon steel cable, all metal lockhead and rigorous real-world testing against lock-picking, corrosion, tampering and for a lifetime in excess of 10,000 key turns means that you can rest assured that ease of use is delivered without jeopardising integral strength. Quality is ensured by deploying the same manufacturing processes as used for surgical instruments. Organisations invest in physical security to protect themselves against network attacks, the cost of lost productivity and broken reputations. A physical lock is an investment that pays back every time it’s used.